Home prices across the U.S. are reaching all-time highs, prompting worry over another boom-and-bust scenario like we experienced roughly ten years ago. Yet, as we glance across the state of residential real estate, what is clear compared to the last extended run of price increases is that lending standards are now much stronger than they were before. Incomes must be verified, a reasonable amount of money must be paid toward the home prior to purchase, and a more stringent loan approval process is in place to prevent a repeat performance of the Great Recession. Unfortunately for DFW area millennials, the Dallas Morning News reports that “the average millennial in Dallas would have to save for 10.4 years in order to to afford a down payment on a home.” While millennials, in general, are having a slow transition from renting to buying, they are at the top of the housing industry’s wish list for potential buyers. Nationally, 32.1 percent of millennials own homes, but the DFW number is much lower. With home prices up in North Texas more than 50 percent in the last five years, it’s harder for young first-time home buyers to afford a purchase. North Texas Real Estate Information Systems recently released their monthly market statistics, which show another month of increasing home prices. 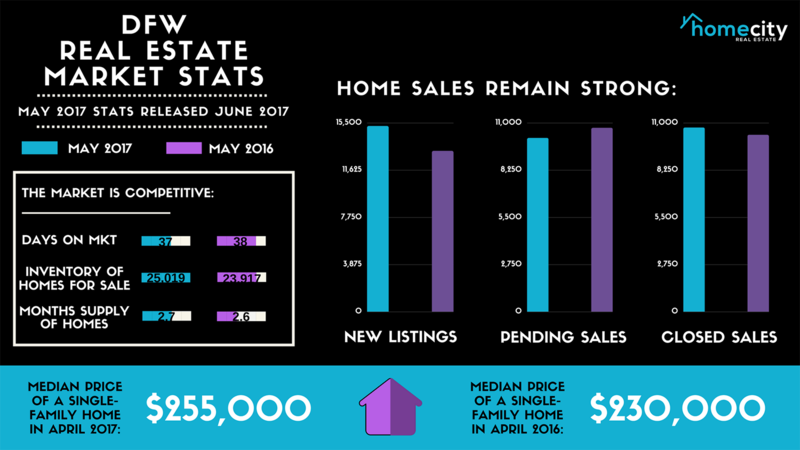 In May 2017, prices moved higher as median sales price went up 10.9 percent to $255,000. Despite this, new listings were up in the North Texas region 15.5 percent to 15,239. However, pending sales decreased 5.5 percent to 10,119. Inventory grew a bit (4.6 percent) to 25,019 units. Days on market decreased 2.6 percent to 37, but months supply of inventory was up 3.8 percent to 2.7 months., indicating that supply increased relative to demand. In addition to a stronger base upon which to conduct real estate transactions, the overall economy is in better shape than it was a decade ago. More jobs are available, unemployment is relatively low, and workers have more faith in their wages and the potential for wage increases. Although we continue to battle an inventory shortage in much of the country, optimism remains high for a successful summer for buying and selling homes. There are several options for millennials and all first-time home buyers alike for paying little to no down payment including FHA loans, VA loans, and USDA loans. Your agent and lender can help you decide which is the right option for you. If you really want to own a home in the DFW area, it’s not as difficult as one may think! Check out our Tips for Young Homebuyers for even more ways to take the plunge into home ownership!